One of the many serfs owned by the Sheremetevs, Praskovia, then an 8-year-girl joined the Count’s private theater — a passion that was very much in vogue among the late 18th century Russian nobility. The Sheremetev’s all-serf household company and orchestra were among the very best this country could offer back in those days. The actors were trained to be real professionals. Early in their life these serf children were taken in to be schooled in foreign languages, music, dancing, good manners and, of course, acting. Among those lucky ones was the little Praskovia Kovalyova whose father was a farrier it the Count’s household. Skinny, with big eyes giving her face a little scared look, the girl immediately stood out from the rest with her wonderful voice, perfect musical ear and exceptionally good memory. These talents were not lost on the young Count Nikolai Sheremetev who immediately appreciating the girl’s unique talent just could not wait to start training her as a future actress. 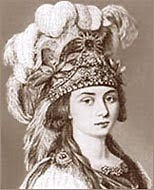 At the age of 12, Praskovia made her debut on stage where she appeared as the main character and under a different name. Unsatisfied with Praskovia Kovalyova’s common-sounding surname, the Count decided to change it for Zhemchugova, a name he thought was more appropriate for an actress. The love affair between Count Sheremetev and his serf actress set the rumour mill rolling with the high society really shocked to see the Count to be so madly in love with his servant and even preparing to build a theatre for her in his Ostankino estate just north of Moscow. And still, this public criticism of his choice was really playing on the young Count’s nerves who realized all too clear that the society would never forgive him if he ever married a common girl. In the meantime Praskovia the actress was making strides on stage and her theatre’s biweekly performances always played to a full house. And then, as the very height of her professional career something terrible happened… Praskovia went down with tuberculosis and her doctors told her to stop singing for a while. The performances were all cancelled and Praskovia, to whom theatre was everything, was pained by this forced inactivity. Frustrated, she just idled around playing the harpsichord. Meanwhile, the disease was taking its toll, and so the Count finally made up is mind to make Praskovia his wife – a painful decision which he had been mulling all those years. The couple were wed in secrecy, but Praskovia’s fate was already sealed. On February 3, 1803 she gave birth to a son and 20 days later, weakened by her illness and the painful delivery, she died. The Count then rushed to announce his marriage to Praskovia Zhemchugova and the birth of their son – and you had to be a really audacious person to do something like that back in those days! Unrivaled as she was as an actress, Praskovia Zhemchugova still remained a “comedian” whose art was largely looked down on as lowly entertainment. She was the pride and glory of the Sheremetev theater, applauded by the royals and still, the society refused to treat her as their equal. Did you know that you can shorten your links with AdFly and earn money from every visitor to your shortened links.